A a code weaver built for use in Unity Engine. Based very heavily off of Fody. Implmented using Mono.Cecil. A great example of this is the Unity Project Updater. It uses both versions of code weaving on your project. It uses text replacing for unsupported code in your source files and IL weaving for compiled dlls. 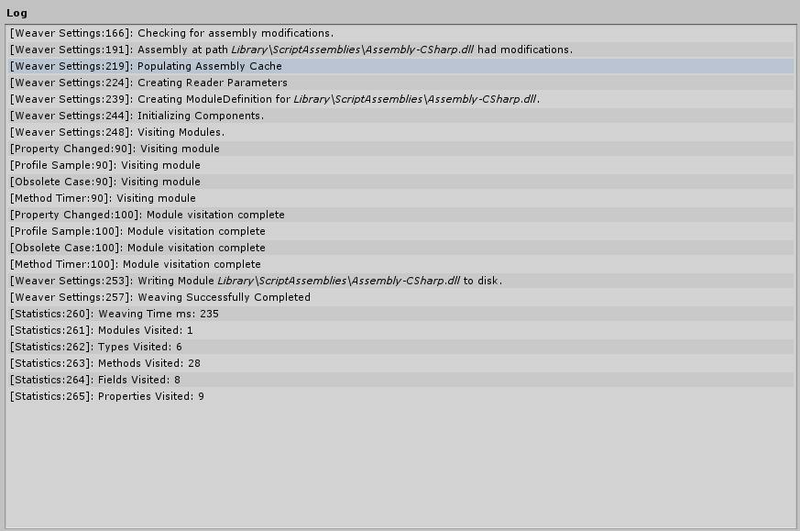 Weaver for now only uses IL Weaving which runs once every time an assembly is recompiled. Hooked into Unity callbacks to run automatically. Filter only the assemblies you want to weave. Utility functions to write MSIL. Weaver is run using a single ScriptableObjects you will need to create a new instance for your project. 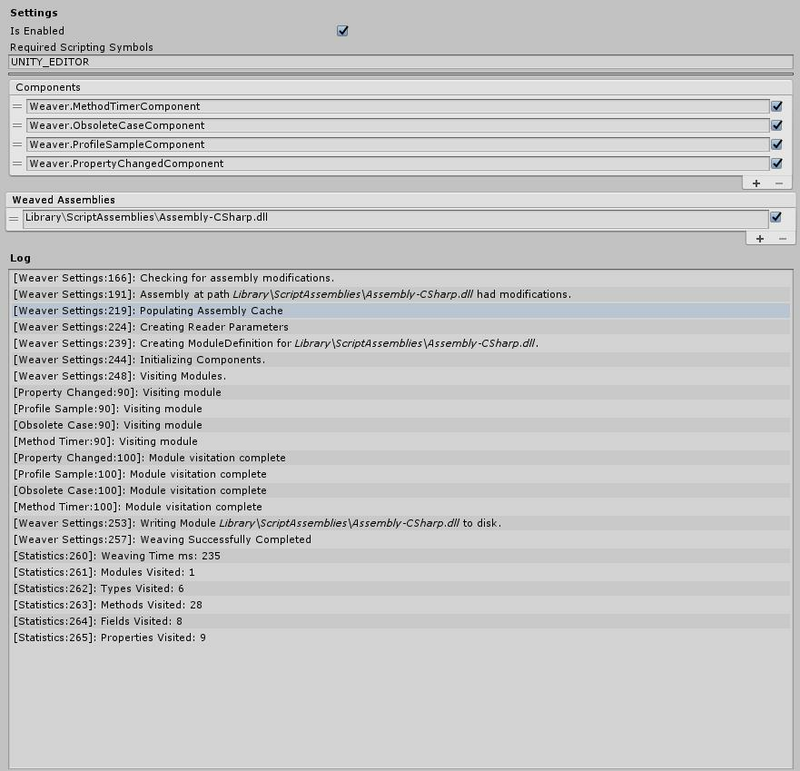 Int Unity use the create menu to create a new instance. You Only Need One: Only one instance should exist in your project since every operation only needs to happen once. When you create a new instance by default Weaver will not edit any assemblies. It is up to you to define which assemblies you want to be modified. Click on the + icon on the bottom right and a context menu will pop up with all the valid assemblies you can target. You can also disable the assemblies in this list by unchecking the check box beside it’s name. This will stop them from being edited. Menu Content: The assemblies in the menu are populated with reflection and will be found if they they are anywhere ein the Unity Project. Weaver is built around it’s components as they are what do the weaving of the assemblies. Weaver itself is just a provider of information for the components. They get notified when they should run and on which assemblies they should run against. To add a new component use the (+) button to open the menu and pick any option. There Can Only Be One: You can only have one instance of each component as having more would be useless. Adding New Componet Types: The component menu uses reflection to find all types that inherit from WeaverComponent and are not abstract and are part of the EditorAssembly. Any new classes that match thoese rules will populate inside the menu. To make the process a bit more clear but also not spam to your console Weaver logs all it’s contents to it’s own console on the ScriptableObject. Errors are also logged to the Unity console because that is important. If you would like Weaver to not run while in your project you can uncheck Is Enabled in the settings object. You also have the option to define if Weaver will run depending on the Script Symbols defined in Unity. You can use any flag like UNITY_EDITOR or the inverse flag !UNITY_EDITOR. Weaver will only run if all flags are active. Method Timer - Any method with the MethodTimerAttribute will be timed using Stopwatch and logged to the console. Profile Sample - Any method with the ProfileSample attribute will be have a profile sample injected into the method. The sample name will be the name of the method. Capture Groups: Used to generate the screen shots because I am too lazy to do that by hand. All code is under the preproc CAPTURE_GROUPS so feel free to remove this if you copy over the code. If you have any feedback or suggestions for Weaver feel free to contact me.